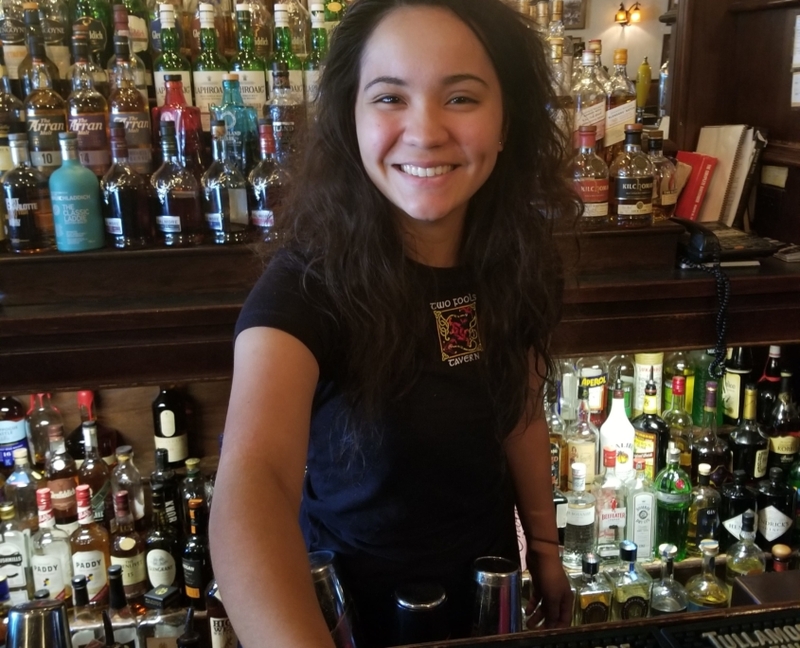 Two Fools Tavern is an unrelenting dream finally realized by folks who had a desire to bring a real Irish pub and eating establishment to Albuquerque, New Mexico. 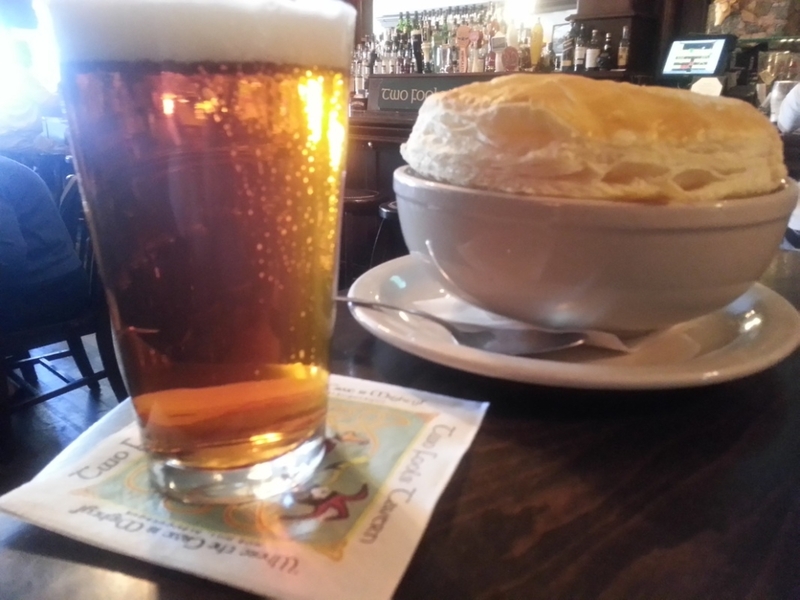 They envisioned and executed faithfully an authentic replication of the pubs they had visited in Ireland. 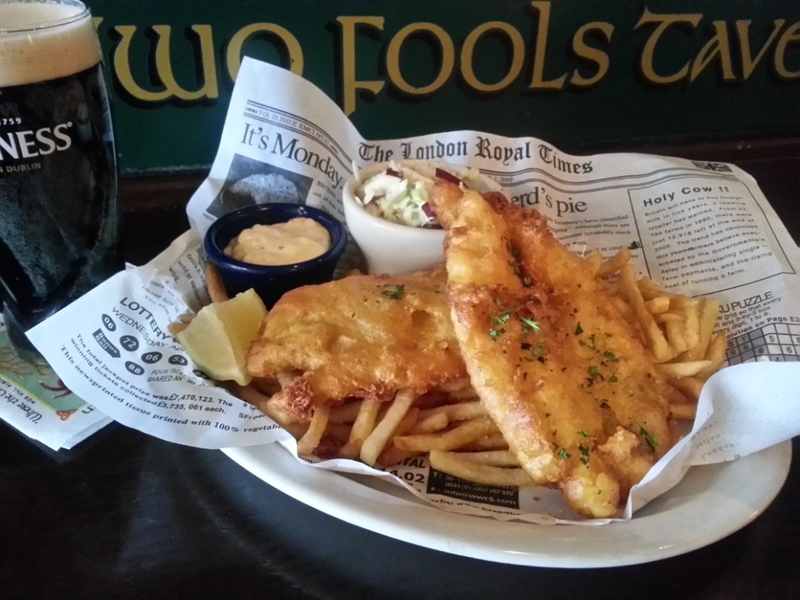 The warmth, charm, European feel and essence is all evident in the Two Fools Tavern. 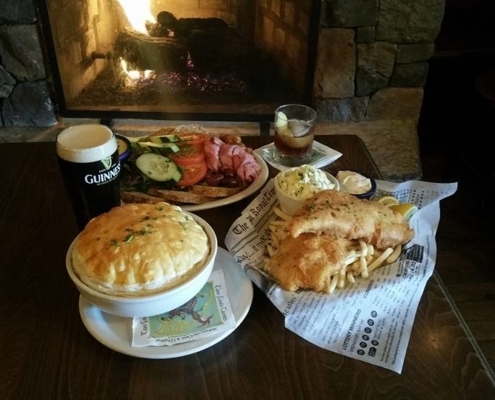 The colors, furniture, pictures on the wall, the knick knacks placed throughout … and of course the ales, stouts and fine whiskies and cuisine of the Emerald Isle is all here to enjoy. 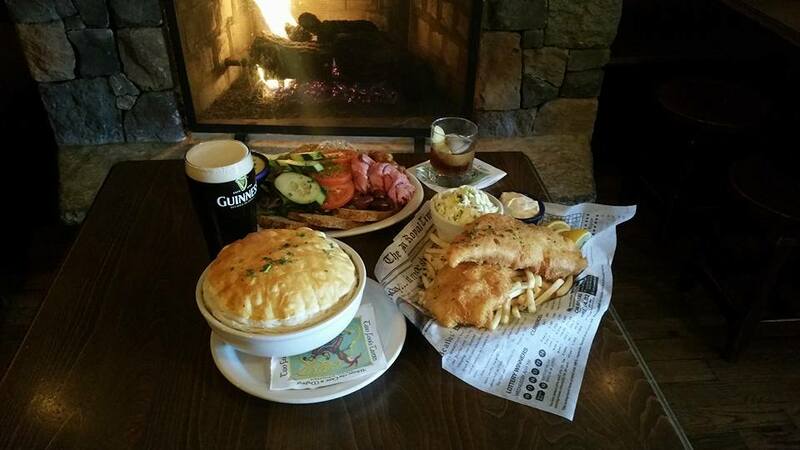 The tavern invites everyone (of age) to come and visit, imbibe in a Guinness, artfully poured, and partake in your favorite Irish food. Come join in daily for the camaraderie, the good times and the spirit of Ireland. 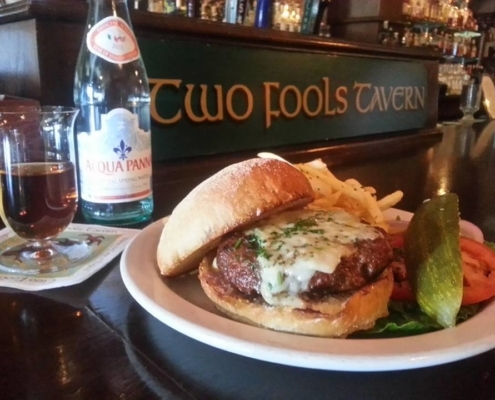 If you’re looking for something different, something truly special, Two Fools Tavern is the place to be for cocktail hour, lunch time, dinner time or anytime. We offer the largest Whiskey selection in the Southwest! Tom and Jeff are the two Fools that you will most likely come in contact with at the tavern. They have, jokingly, identified Pete and Alan as the Fools for following them into this venture. 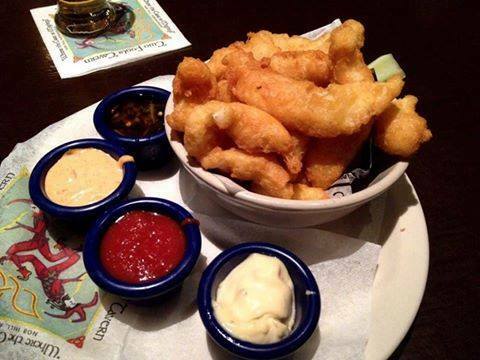 Our Famous beer battered fish, cut into bite size pieces and served with four dipping sauces. A great way to satisfy your fish craving! 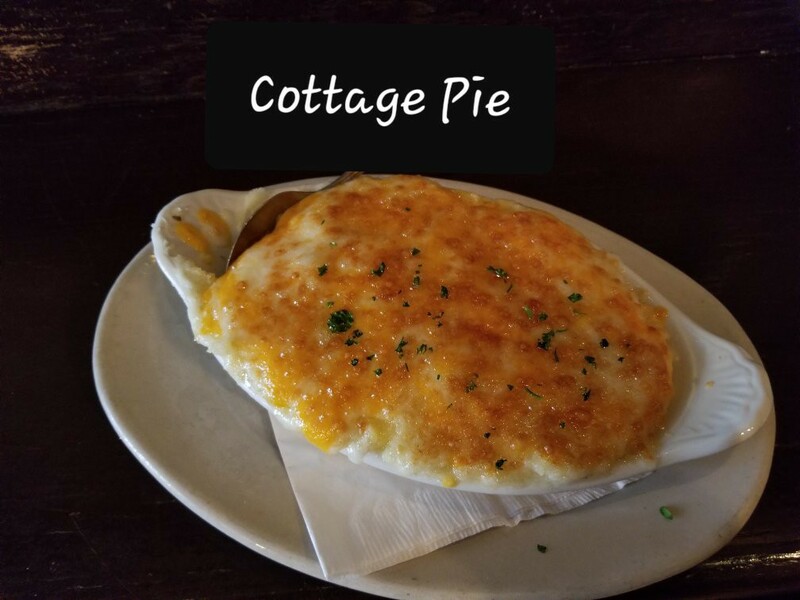 House made Irish potato chips topped with cheddar, green chile & our Cottage Pie beef. Made the traditional way, fresh & spicy. 13 chicken wings served with your choice of our house made Guinness BBQ sauce or the same old hot sauce everyone else has OR-try a combo of both! Two hard boiled eggs wrapped in house made sausage & bread crumbs, cooked to a golden brown & served with pub mustard. 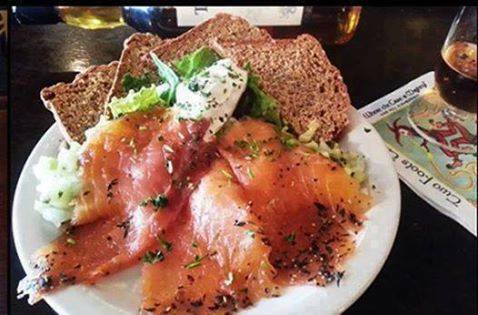 House Made, Irish Whiskey cured, Gravlox Salmon served with a cucumber & caper relish, blue cheese spread, lettuce & house made Irish brown bread. Served with house made Irish brown bread, & Irish potato chips. Gooey & bad for you! Crispy fries smothered in melted cheese & green chile. Shredded cheese, black beans & green chile served with sour cream & guacamole add beef or grilled chicken for a buck! Tender chunks of sirloin with carrots, celery & potatoes slowly simmered in Guinness & beef stock. 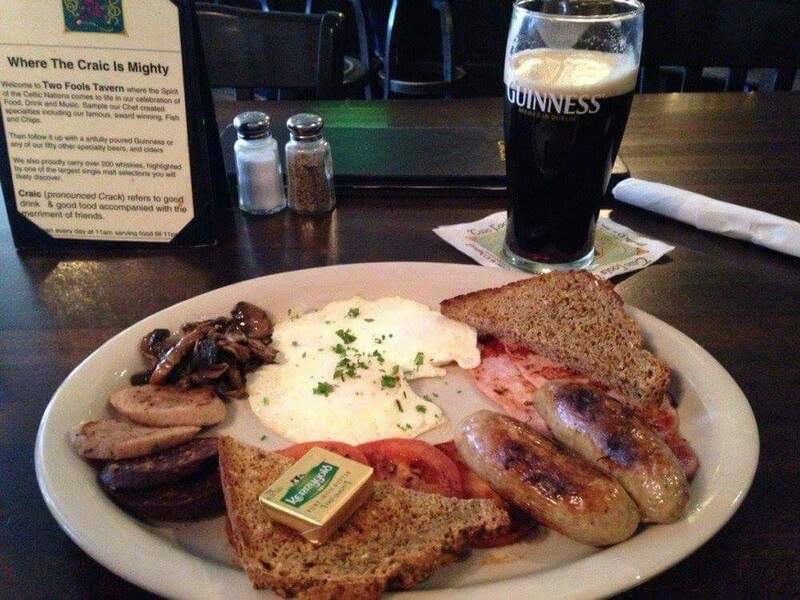 Served with a side of house made brown bread. Tender chunks of sirloin with carrots, celery & potatoes slowly simmered in Guinness & beef stock. 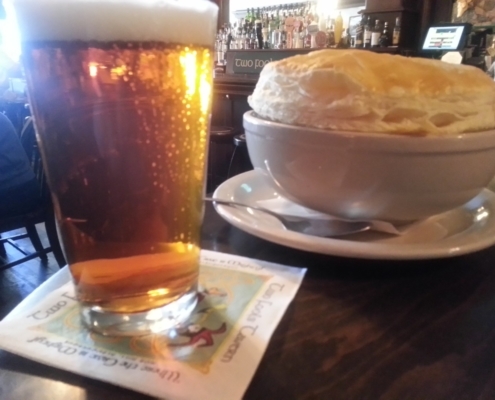 Served with a side of house made Cup of stew. A not-so traditional chicken pot pie. Slow simmered with chicken carrots, mushrooms, potatoes, peas & green chile topped with a flakey pastry crust. An un-intimidating salad with your choice of the usual dressings. Chopped lettuce, tossed with chicken, avocado, blue cheese, diced tomato, cucumber, & bacon in our house mustard dressing. A crisp wedge of iceberg lettuce sprinkled with bacon, scallions, blue cheese crumbles, tomatoes, served with blue cheese dressing. Baby spinach leaves, with Black Forest ham, diced tomato, egg, mushrooms, candied walnuts, & diced Swiss cheese served with our house mustard vinaigrette. Crispy lettuce, avocado, grilled chicken, bacon, blue cheese, egg, cucumbers & with your choice of dressing. A cup of soup or a tavern salad, with a half sandwich. Pick from Turkey, Pastrami, Ham, or Roast-Beef, plus your choice of cheese & bread. House made Bailey’s Irish Cream Bread Pudding served with a Jameson whiskey sauce. 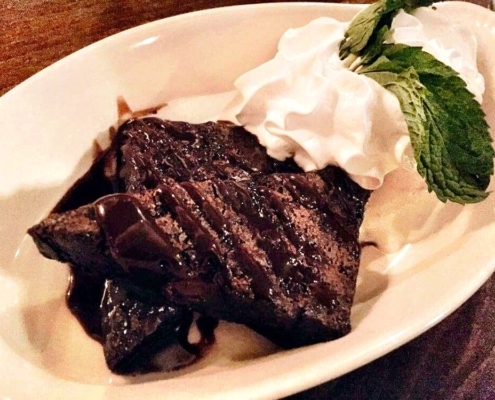 Served warm, topped with chocolate sauce, & vanilla bean ice cream. Served with a homemade whipped Irish Cream topping. Fresh made tart, with caramel! Warmed- then served with vanilla bean ice cream. Vanilla bean ice cream topped with Auchentoshan triple wood scotch & coffee liquor Sorry must be 21 years old to enjoy. Your choice of meat served with Irish cheddar, tomato chutney, mixed greens, cucumbers, fresh tomato, olives, & house made Irish brown Bread. Angus beef simmered with onions, carrots, peas, & spices. 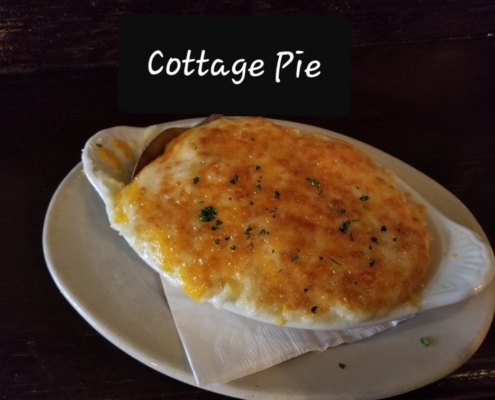 Topped with whipped potatoes & Shredded cheddar cheese. Home cooked corned beef served with a wedge of cabbage, new potatoes, carrots & topped with whisky mustard sauce. 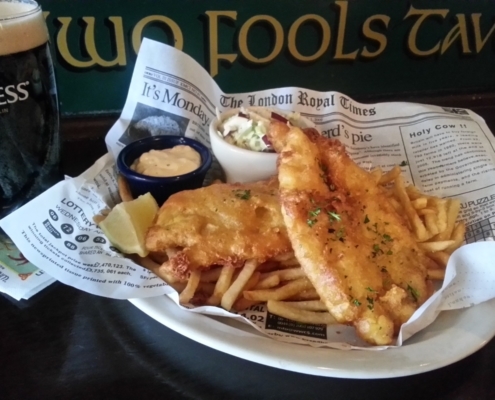 Our Award winning recipe begins with Two Pieces of our house ale battered, sustainable, North-Atlantic Haddock, served with chips, Homemade apple coleslaw & tarter sauce. Two traditional English sausages served over mashed potatoes with a savory Guinness & onion gravy. Two House made potato pancakes filled with slow simmered Guinness beef stew. Sandwiches That You Will Like! 8oz Fresh hand Formed Harris Ranch All Natural Beef Burger, sautéed sweet onions, 1000 island dressing & Swiss cheese on grilled rye bread. Mesquite smoked all natural turkey breast, Monterey Jack cheese & green chile on fresh baked daily, grilled sourdough bread . Corned beef, Swiss cheese, Franks sauerkraut & 1000 island dressing on grilled rye bread. Cage Free all Natural Grilled chicken served with Irish Cheddar & bacon. Thin sliced house made roast beef, served with grilled onions & mushrooms, topped with Irish white cheddar cheese & served with a side of Au Jus. All Natural Seasoned Pastrami & Swiss cheese served on really good rye bread. Pile on Your Favourite Toppings 75 Cents Each to any sandwich… Sub Gluten Free Bread. 8oz of fresh hand formed Harris Ranch All Natural Beef, Just like mom made, served on asemolina bun. It’s probably not your first burger, so accessorize it how you like..!! Mesquite smoked all natural turkey breast, bacon, avocado, blue cheese crumbles, sliced tomato, shredded lettuce, & blue cheese dressing on sourdough bread. Tender pulled pork simmered in our own Guinness BBQ sauce & topped with our home-made apple slaw, delicious! 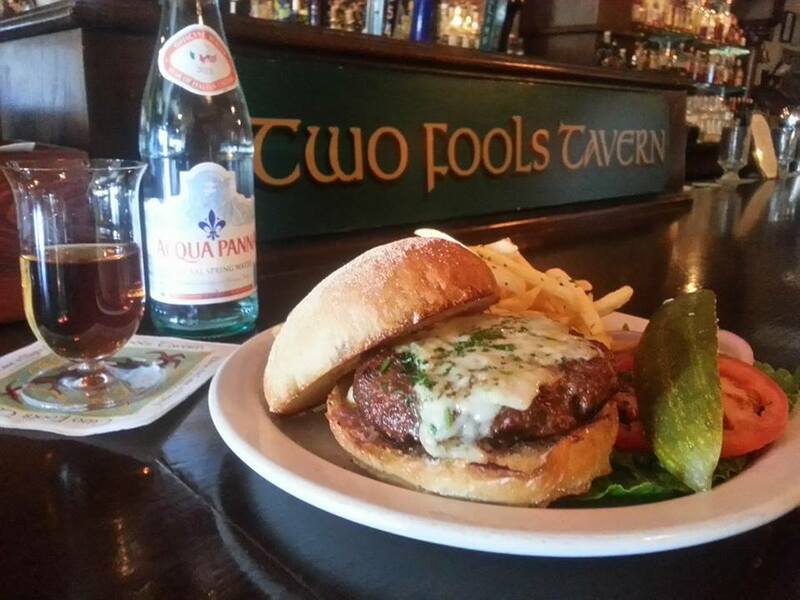 8oz Fresh All Natural burger seasoned with Cajun Spices & topped with melted blue cheese. A spicy black bean burger grilled, & served on a 9 grain bun. Fix it up as you like.